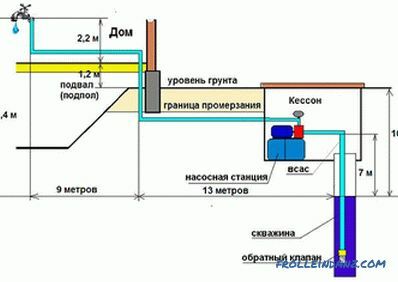 The organization of a water supply system in a country house is often solved by making a well. This is especially true in cases where there is no centralized water supply. Making a well is not an easy process, and it requires special skills, although some homemade craftsmen can do this work on their own. 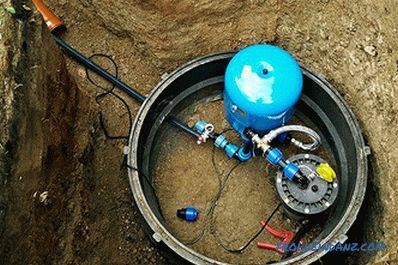 In addition to the manufacture of the well itself, it is necessary to purchase the appropriate equipment for its arrangement. The heart of such a plumbing system is a pump. There are many models on the market. Moreover, the choice depends on the specific water source. You may need a submersible pump, or just enough surface. 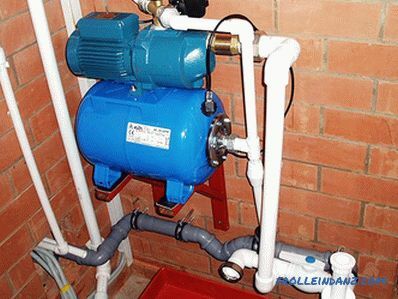 In this article we will talk about how to choose a pumping station for a private house. You will learn about the varieties of this device, what parameters you should pay attention to, be able to familiarize yourself with the characteristics of the most popular models of pumping stations for household needs. Under the cumulative capacity is meant the hydraulic accumulator. In order for the station to work in automatic mode, a pressure switch is installed on it. In addition, this device maintains the pressure level in the hydraulic tank. From this brief description it becomes clear that the design and operation of the pumping station is relatively simple. 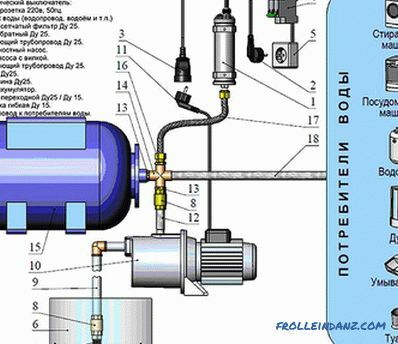 With the help of a pump, water enters the storage tank (hydroaccumulator). 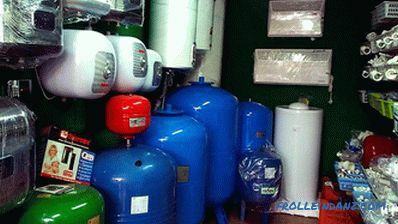 Due to the pressure created, the necessary pressure is formed in the water supply system of a country house. If necessary, the pressure switch turns on and injects the necessary pressure into the system. That is, when the water from the storage tank goes off, the relay is activated and pumps up water from the well to the required pressure indicator. 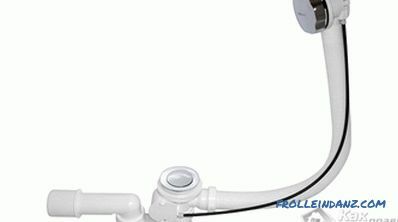 After installation of this equipment during operation, it will be necessary to simply open the tap for the flow of water in the washbasin and shower. Although the principle of operation and the structure of the pumping station are relatively simple, it is worth considering a large number of nuances when choosing it. Therefore, we suggest that you familiarize yourself with all the details of this process. We will understand what you need to pay attention to when choosing. In order not to miss anything, we suggest taking a piece of paper and a pen and marking all the main points . This will allow you to immediately determine all the parameters to which the pumping station you purchased should correspond. If you are ready, then proceed! Volume of the storage tank (accumulator). height from the water level to the pump. Now we will consider each item separately and begin with the main four positions. Here you will need to make some calculations. It should be noted that the main advantage of the pumping station in comparison with analogues is the possibility of its installation in any place. There is one limitation - the selected location should be close to the water intake. This is an important parameter, since the standard suction depth is around 9 meters. It is also worth considering the distance from the water source. An important feature of this equipment is that horizontally it is capable of sucking up water 10 times more than vertically. For example, if the depth of the fence is located at a depth of 7 meters (that is, the station has such power), then in fact the station can extend the water horizontally up to 70 m from the source. Thanks to this feature, the installation and arrangement of the pumping station are carried out inside the apartment building . As a rule, it will be located at a serious distance from the water source, be it a well or a well. L is the station distance from the water source. The result should not be more than 8 meters. 4 + 0.1 * 15 = 5.5 meters. This is an excellent indicator, as it does not exceed the mark of 8 meters. Installation of a submersible submersible pump. Installation of the pumping station, but should be placed as close as possible to the water source, for example, right next to it dig a pit and equip it for the pumping station. In these calculations, the distance from the pumping station to the water intake is taken into account. It is equally important to make calculations of the entire length of the water supply system, namely, starting from the level of water intake and to the water intake points located in the house (shower, wash basin, etc.). This indicator can be found in the technical specifications for the pumping station, it is marked as the head height. The average is about 50 meters. 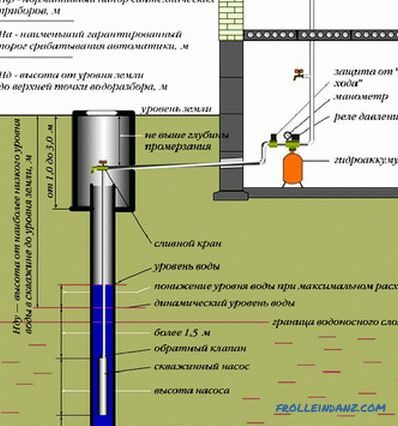 Today there are models that can easily lift water from a depth of 50 meters. Such devices are equipped with an external ejector. However, the ejector is quickly clogged with silt and sand. Repair it is very expensive. For this reason, well-known manufacturers of pumping stations produce models without an ejector. It is important to distinguish between a submersible pump and a station. Depth is mounted in deep wells, hence its name. But in most cases, priority is better to give stations. Why? The thing is that when the electricity is turned off, the submersible pump stops working and, accordingly, there will be no water in the house. As for the pumping station, the presence of a hydroaccumulator (storage tank) will provide for a certain period a private house with water, even when the lights are off. The next thing you should pay attention to is the hydroaccumulator. This device stores energy from the fluid and releases it when needed. The name consists of two words "hydro" (liquid) and "battery". Its main, but not its only function, is to accumulate liquid under pressure and smoothly change the pressure in the system. It works in conjunction with a pressure switch. Due to this, automatic operation is achieved. Having a small amount of water. Restriction regarding the momentary re-start of the pump. That is, the situation is as follows. 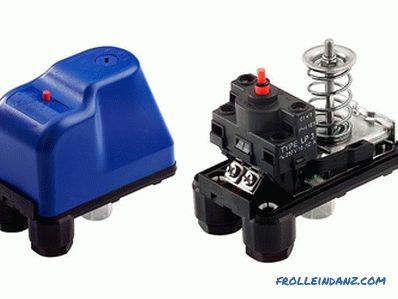 Without a pressure accumulator, the pressure relay will not work correctly, since an instantaneous change in pressure in the system (when the consumer valve opens / closes) would turn on / off the relay, as a result, this would lead to a breakdown / overheating of the electric motor or relay. We will explain this nuance in more detail. Taking into account the fact that water is practically not being compressed, without the presence of a hydroaccumulator, switching on a pump with a pressure switch would lead to a sharp increase in pressure in the system. As a result, the relay would immediately give a signal to shut off the pump. If at the same time open any water intake tap, the pressure in the system would instantly drop. Accordingly, the relay would immediately send a signal to the pump to turn it on. Considering that the pressure in the system would change with great speed and frequency, the operation of the relay and the pump would be constant, which causes them to overheat and fail. Another interesting fact is that the water pressure generated by the pump has almost no effect on the change in the volume of liquid, it is equal to hundredths of a percent. Such simple calculations make it clear that the presence of a hydroaccumulator with a pressure switch at the same time is the optimal solution. What to look for when choosing this capacity? In this matter, immediately clarify an important detail - the hydroaccumulator does not pump water itself and does not create pressure. It maintains the pressure of the fluid that is created in it by the action of the pump. For this reason, the question is what volume of storage tank you need to buy, if you have 2 souls and the like, is incorrect. Water is supplied from the hydroaccumulator only until the pump is turned on. The main water supply occurs under the influence of the pump. As soon as all the taps are closed, the pump shuts off and at the same time the pressure in the tank rises. Mostly the device case is made of stainless steel or metal. Inside is a rubber pear. It is just the same, and enters the liquid and stored there. In the tank body itself there is air, which exerts strong pressure on the pear. The more water inside it, the more pressure is created. When water is used, the pressure in the rubber bag is reduced. It also has a pressure switch sensor. As mentioned above, it automatically pumps the fluid and turns on / off the pump. Favorable operating conditions for the pump. 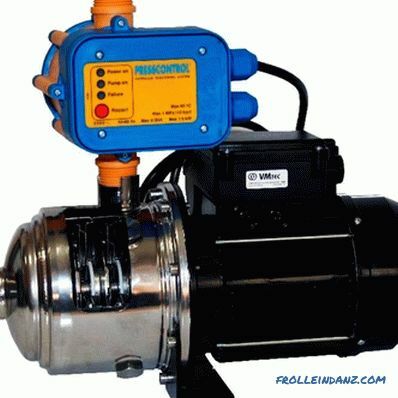 The number of on / off cycles of the pump is reduced (the ideal number of starts is about 50 times per hour). 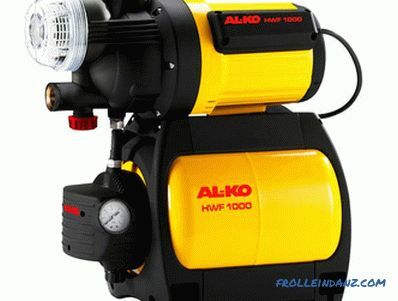 Immediately it should be noted that the pressure in the air cavity, unlike the pump start pressure, should be 10% less. That is, if the minimum pressure is 1.5 atm, then in the accumulator the optimum air pressure should be 1.35 atm. How did we get this value? 1.5 atm - 0.15 = 1.35 atm. This number (1.35 atm) determines the pressure level inside the air chamber of the hydroaccumulator. 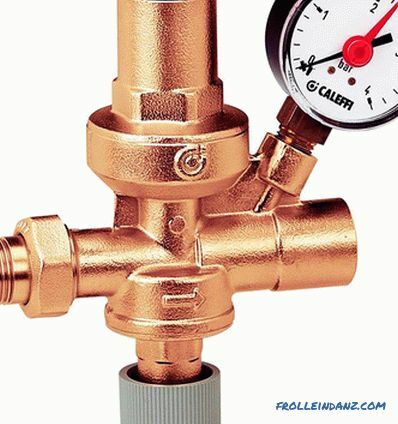 If you did not carry out self-tuning, then you can find out the minimum pressure in the system when you turn on the station on the pressure gauge. What will happen if the pressure is below this norm or even equals zero? This will lead to frequent switching on / off of the pumping station. This will happen after each on / off tap. If a similar phenomenon occurs, it means that there is insufficient air pressure in the accumulator. To measure the pressure, an ordinary pressure gauge is used, which is used to check the pressure level in automobile tires. On each tank there is a fitting with a valve. 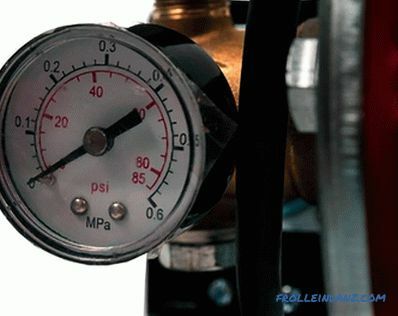 Immediately before measuring the air pressure, the water pressure in the system should be reduced to zero. To do this, turn off the pump station from the power supply and open any tap until the water is completely drained. If water enters when the valve is pressed, this is a sign that the pear is broken. It should be replaced. In order for the pear to last as long as possible, do not make a large pressure drop between the pump on / off cycle. The ideal differential is 1-1.5 atm. The air pressure can be increased by a conventional automobile pump through a nozzle with a slide valve. As mentioned above, frequent switching on of the pump leads to its malfunction. Moreover, it increases the power consumption. To minimize this probability, it is important to choose the volume of the accumulator. The choice of capacity should be based on the number of people living in a private house. For one person, a volume of up to 24 liters is enough, for two or four, 50-80 liters is enough, and so on. But remember, these calculations are relevant if the water supply of a private house will occur all the year round. If you plan to use the cottage only seasonally, then you can get by with a small accumulator of up to 20 liters. If you plan to water the water passing through the accumulator, then you should install a container with a volume of at least 50 liters. But one should not assume that it is better to buy a hydroaccumulator with a large margin in order for sure. In this situation, the principle does not work the more, the better. The water inside the tank can stagnate and have an unpleasant smell, so the volume of the tank should correspond to the approximate water consumption. In terms of quality and price, the most common option. 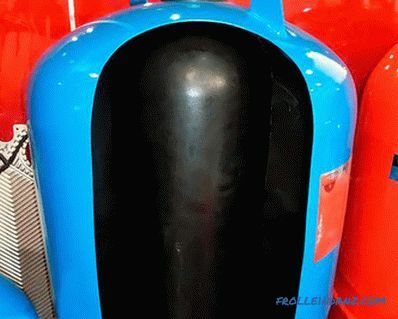 To prevent the formation of corrosion, the tank is covered with protective paint. The cost of such a capacity is much higher. However, its durability justifies it. Such stations can be mounted even on the street where unstable temperature and high humidity are observed. At the same time, remember that the material of the hydroaccumulator does not affect the quality of your water. 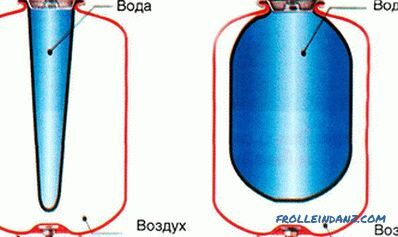 This is explained by the fact that the water inside the tank does not come into contact with the metal walls, as it is in a rubber bag. Therefore, the choice should be made based on the environment where the installation will be carried out. If this is a street, then it is advisable, but not necessary, to purchase a stainless steel tank. 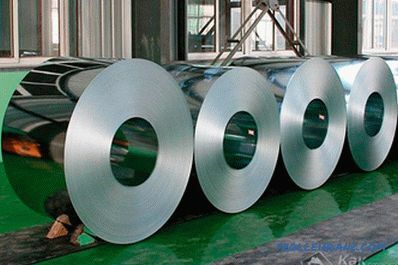 Although a large number of people buy ordinary steel. They are more affordable in price and have a good reputation for use. Number of water intake points. Distance from the pump to the well. The flow rate of the source, i.e. the actual volume of water that the source can give. Today, stations with capacity from 500 to 1500 W are mostly sold. 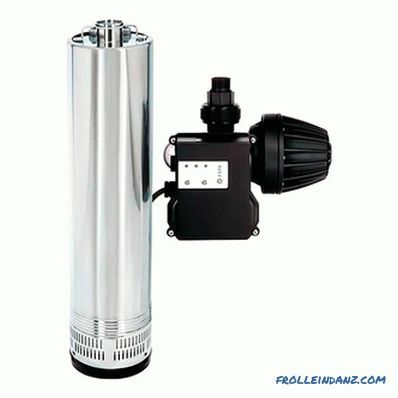 If your house is small, then a 750 W - 1000 W pump will be enough. Just in this case it is better to choose a motor with a small margin. After all, there is always the possibility of expanding water consumption, for example, you decide to install several additional water points or you wish to water your garden. Such an indicator as performance directly depends on the power - parameter, which we reviewed above. Performance refers to the volume of water that a station can pump in 1 hour, and it is measured in cubic meters or liters. In this case, the approach should not be the same as with the power (it is recommended to take a more powerful motor). The performance calculation should be based on the flow rate of the source, that is, the volume of water that the source is able to produce in one hour. As a rule, in the manufacture of a well, this indicator is indicated in the technical passport. If measurements were not made, they can be performed independently. How? To do this, turn on the pump and pump out the water for an hour. During this procedure, you should monitor its level. It is important to know the performance of the pump. You can build on the following averages. When servicing a summer house, water consumption can reach 1000 l / h. If we are talking about stable living in a private house, and water supply is necessary on a permanent basis, this figure reaches 6 thousand l / h.
Some experts suggest taking into account the flow of water in one tap. An average of 14 liters per minute is counted. Very often the performance and power figures do not match. It's not scary. When pumping water takes into account the impeller of the pump, not just the motor. The wheel is located on the shaft, consisting of several disks. Between these discs there is an impeller. 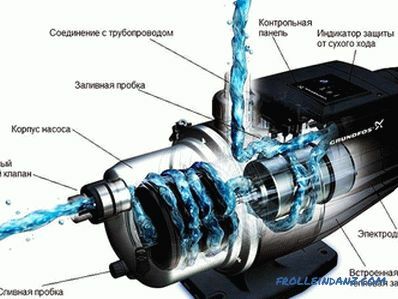 It is precisely under its influence that a centrifugal force is created, under the influence of which water is pressed against the walls of the pump and ejected. To figure out how to choose a pumping station that would serve more than one year, you will have to study a large amount of information. Above, we have considered the main parameters, which should be paid attention to when choosing this device. Now note some important details. Immediately it should be said that some do not pay attention to them.They prefer to trust the sellers from the store, thinking that they are completely objective in this matter. Often, however, their estimates are based on a personal view or the need to sell a particular model at the request of management. Given this, we suggest you explore all the details yourself. So it is important to understand that all parts of the pump must cope with high water pressure. For example, the impeller always works under strong blows of the water jet. If it is made of low-quality material, then it will quickly break. Further, as the chain fails the impeller, oil seal and so on. It is made of plastic, stainless steel, steel or cast iron. As for plastic, it is a budget option and short-lived, while its cost is low. Stainless steel, of course, is considered the best option. The only downside is the high price. Also there are products from cast iron. Such pumps are hardy, but have a high cost. This structural member must be made of stainless steel. Also allowed is steel that has been heat treated. This element must be quite durable. This element is constantly under strong influence of a huge water pressure. In most cases, manufacturers use technopolymer. It is not subject to corrosion, abrasive resistant. According to its technical characteristics, it resembles aluminum. If we talk about the most reliable option, it is a stainless steel impeller. You shouldn't mention low-quality seals. 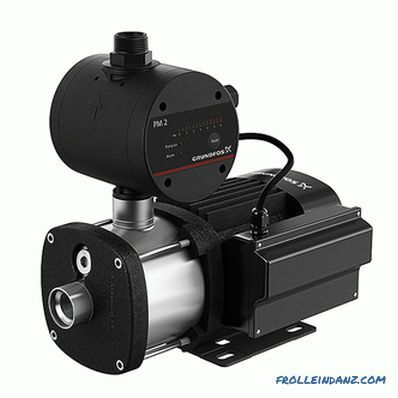 It is better to select expensive models of pumps from reputable manufacturers. A braided cord made of asbestos is used as a sealant. Inside it is brass or copper wire. This element is extremely important, because, given the hydraulic laws, the diameter of the water always influences the water pressure , in particular nozzles. For a higher water pressure in the tap should be nozzles with a larger diameter. Although not always true. For example, for the organization of watering works it is better to install the output narrowed nozzle. In this case, the speed and pressure of the water flow will be at a high level. Still, ideally, the diameter of the nozzle at the station of your choice should be large. So, starting from these important indicators, you can select a station to give high quality. Now we will pay attention to each element separately, because, due to their presence, the work of your pumping station will be long and safe. At first glance here everything is clear. The pump is simply equipped with a special relay with a sensor that prevents the pump from operating from the so-called dry run. But it is important to understand what is this dry run and whether it is terrible for such pumps. 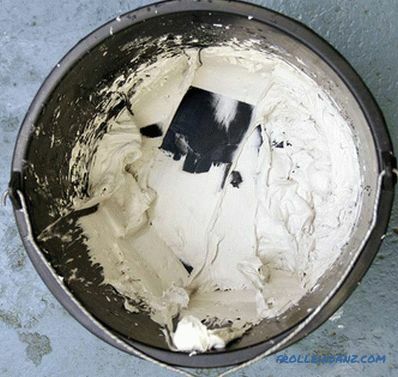 It is worth noting that dry running is dangerous only for household pumps. 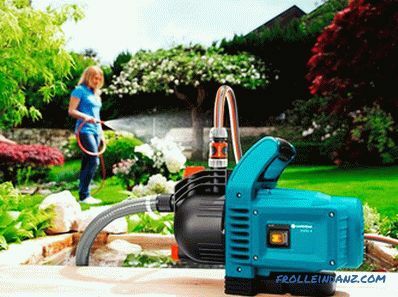 At the same time, the pump is no longer afraid of the lack of water, but the high temperature that is formed during the operation without coolant, in particular, water and acts as water. 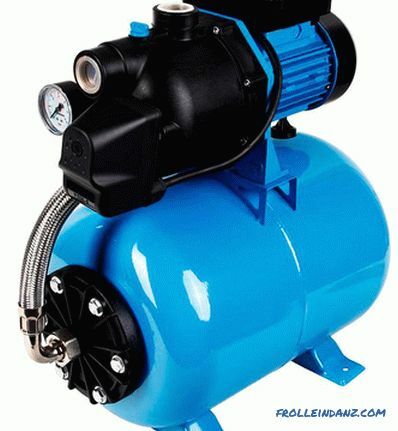 Therefore, the correct definition would be this: dry running is the operation of a pump without water or with a small flow of water, which does not provide cooling for the internal elements of the pump. The principle of operation is very simple, as soon as the water in the source drops to the lowest possible level, a sensor is triggered, which sends a signal to the relay, the relay in turn gives a signal to turn off the pump. As a result, the operation of the pumping station is terminated as the power supply chain is broken. the water flow at the outlet pump nozzle. 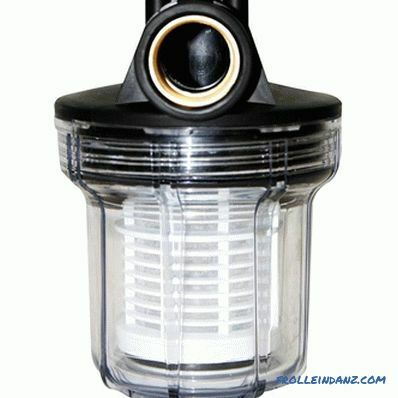 A filter prevents unwanted debris from entering the pump and accumulator. Such a filter will trap silt, sand and other dirt. Some stations in their configuration already have such a filter, but in most cases you should additionally purchase it. 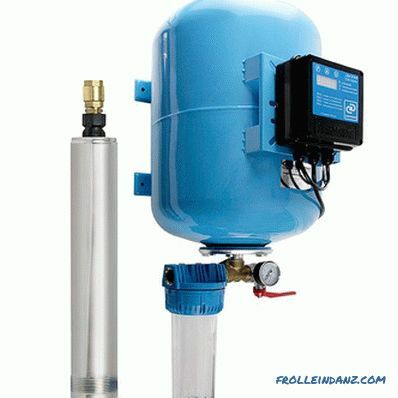 It is also possible to additionally install a fine filter station. In this case, the water will be of higher quality. It should be noted that both coarse and fine filters should be removable for possible replacement or cleaning. The presence of a check valve in the pumping station is imperative. He does not allow the water to go out of the pump. It is installed in front of the accumulator or at the end of the suction tube. In the absence of such a valve, water will partially flow out of the storage tank, thereby reducing its volume. Because of this, the pump will turn on more often. So, we have reviewed with you the main technical characteristics that are important to consider when choosing. Consider now the types of pumps that are the heart of the entire plumbing system of a country house. 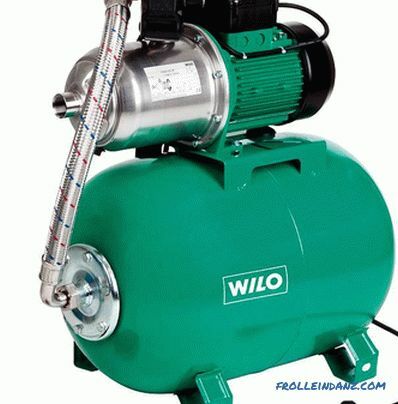 Ability to pump high temperature fluid. High sensitivity to air suction. Instability to the presence of abrasive in water. Absorption depth up to 9 m.
Tolerate to a small amount of air that is sucked together with water. We tolerate the presence of abrasive in water. Sensitive to dry running and temperature extremes. Large dimensions and large pump weight. Now let's get from theory to practice. 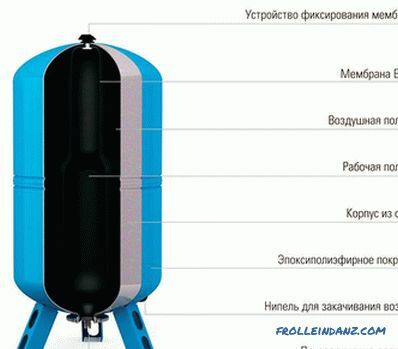 Although there is a wide variety of various pumping stations, we have identified the most popular in the Russian market in a different price range. 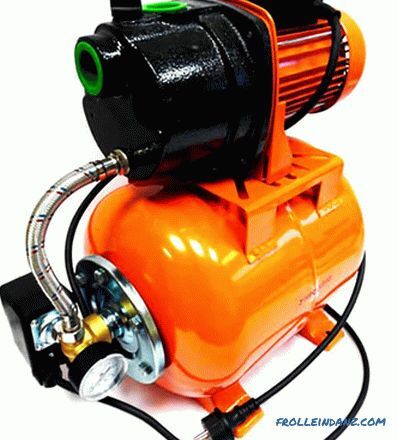 This pump model is a product of co-production from Russia and China. The price for it varies around 5,500 thousand rubles and above. This device is easy to use. 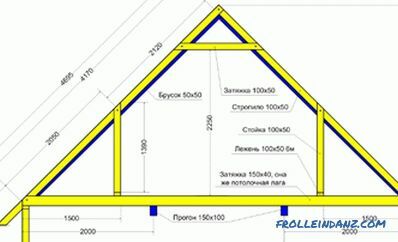 It is mainly used for the organization of a small pressure of water at the dacha. Given this, such a pump is excellent for organizing water supply from the well . The working part and the pressure chamber are made of stainless steel (this prevents the formation of corrosion). The pump power of 600 W allows using the station in the dacha cooperatives, where there are established norms for electric power consumption. In the configuration of the device, there is a short power cord, so you have to either increase it or completely replace it with a new one. 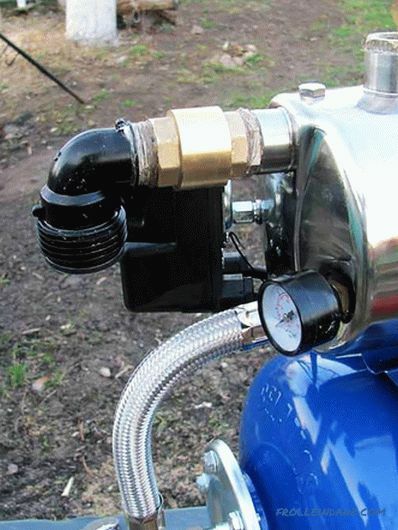 A thin hose is located between the pump and the accumulator (this explains the possibility of creating a small water pressure). It is worth highlighting the possibility of automatic management, organization of uninterrupted water supply and a wide scope of application. Pumping station NeoClima GP 600/20 N has a large capacity. The station is designed for a limit of up to 8 meters. The limit is around 35 m, in practice this figure reaches 25 m.
The maximum indicator is 3 m 3 / hour. The real operating point is in the region of 1.5 m 3 / hour. The collection capacity holds up to 20 liters of water. Only horizontal installation is allowed. This pumping station was made in the Celestial. It costs from 6 thousand rubles and above. There is no check valve and filter in the kit. It is a great helper for summer residents. It can be used in combination with a well or well. 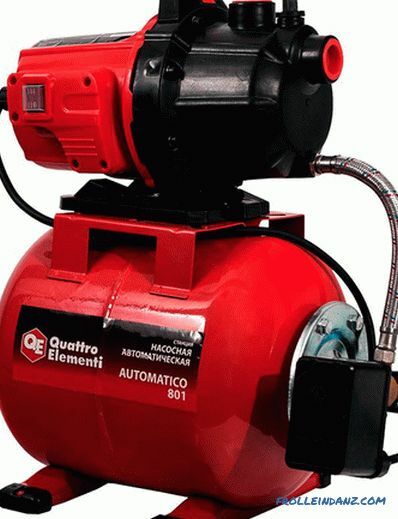 After a small revision of it, namely the installation of a check valve, a filter and, if necessary, an additional accumulator, this unit will serve its entire specified period of five years. The package includes a pressure gauge that monitors the water pressure. For ease of use, the model has a special mounting legs of the unit in a horizontal position. This indicator is 8 meters, however, if the water mirror is above, the distance from the pumping station and the consumer may be increased. The limit is around 40 m, in practice this figure reaches 30 m.
The maximum figure is 3.2 m 3 / hour . The real operating point is in the area of ​​2 m 3 / hour. The collection capacity holds up to 20 liters of water. 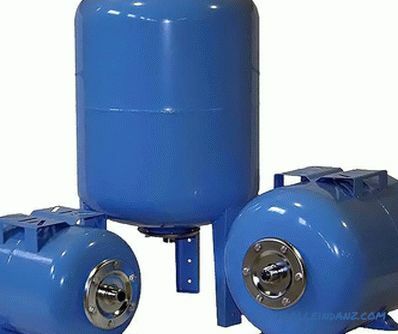 If you often turn off the electricity, you can install an additional hydraulic accumulator. This figure is 9 meters. The maximum figure is 3.2 m 3 / hour . The real operating point is in the area of ​​2.5 m 3 / hour. The collection capacity holds up to 20 liters of water. There is always a chance of a plastic tank breaking. This is a strong disadvantage, according to many. This pumping station is imported from China. It has bright differences from analogs - silent and easy. However, inside the pump there is a plastic tee, which is its weak point. This is especially apparent if the station is left at a negative temperature. This tee just break. The worst thing is that from such a station to drain water is quite problematic. 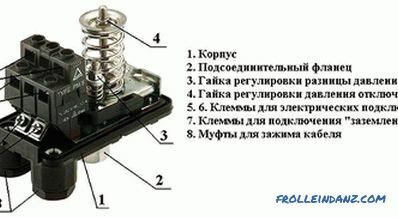 Moreover, it is necessary to study the attached instruction well, since the station does not provide for the use of a dry-running relay. This figure is 8 meters. The limit is around 40 m, in practice this figure reaches 25 m.
The maximum indicator is 2.8 m 3 / hour . The real operating point is in the area of ​​2 m 3 / hour. 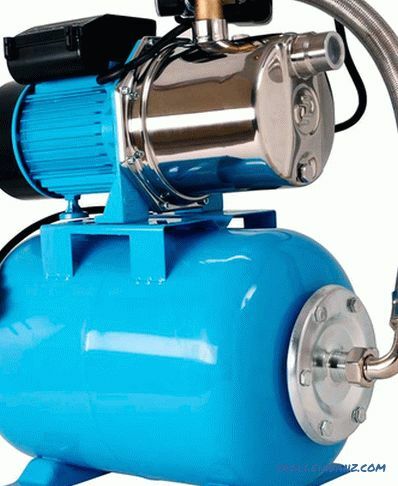 This brand of pump centrifugal station is a product of a domestic manufacturer. With good performance, we can note the relatively low cost of the station from 9 thousand rubles. One of the drawbacks of this device is hard starting. Moreover, if you incorrectly configure it, then it will work poorly. It is also noted that the station is subject to hydraulic shocks with a sharp closure of the crane. On the other hand, the JUMBO pump series has excellent automation. The electric motor has an asynchronous type, which implies the presence of a built-in cooling fan, and the starter itself is protected by a thermal kit. Submersible, installation is allowed only on the surface. Made of high-quality cast iron. The limit is around 30 m, in practice this figure is 20 m.
The maximum indicator is 3.3 m 3 / hour . The real operating point is in the area of ​​2.5 m 3 / hour. Only horizontal installation of the pump station is allowed. A series of domestic producers, easy to install and run. The pumping station is equipped with the necessary automation, among which is a dry run. The main disadvantage is a small resource during intensive operation, is about 4 years (this is explained by the fact that some parts are made of plastic, which wears out quickly). Also, the pump station JILEKS Water cannon PROF 55/90 The house is equipped with a control panel that allows you to program the operation of the pump. 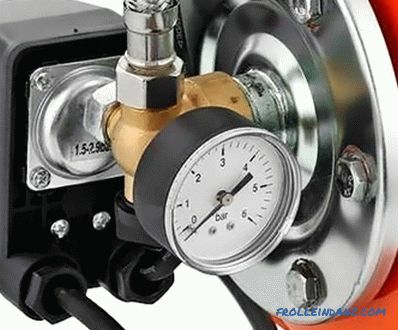 The package also comes with a pressure gauge that controls the level of pressure. This indicator equal to 30 meters. The limit is in the area of ​​90 m, in practice this figure reaches 75 m.
This is a German pumping station, perfectly adapted to modern Russian realities . The cost of the device is around 20 thousand rubles and more. Throughout the life of the high performance. The package includes relay dry run. to fill the pools and tanks. This figure is 30 meters. The limit is in the area of ​​58 m, in practice this indicator reaches 42 m.
The maximum indicator is 8 m 3 / hour. The real operating point is in the area of ​​5 m 3 / hour. This type of pumping station is the benchmark of German quality. However, the station is required in retrofitting, and in particular the installation of a dry-running relay. For all other indicators, this device is reliable and practical for use in a private house. The cost of the unit is around 25 thousand rubles and more. The limit is around 32 m, in practice this figure reaches 25 m.
The maximum indicator is equal to 8.1 m 3 / hour . The real operating point is in the area of ​​6 m 3 / hour. This is a product of the German market. For quite a low cost, which is equal to 19 thousand rubles or more, you can get quite a workhorse. The low cost of the device is explained by the fact that the station is assembled in China, however, all components are supplied from Germany. Therefore, do not be afraid of low prices. The limit is in the region of 48 m, in practice this indicator reaches 38 m.
The maximum indicator is 15 m 3 / hour. The real operating point is in the area of ​​13 m 3 / hour. The station operates without a storage tank. This pump station refers to the type of self-priming with automatic control. The program includes the ability to adjust the cyclical, due to the use of the dry-running relay. In practice, the device in the management is very simple. The only drawback is the high cost, which is in the region of 29 thousand rubles and more. This indicator is 8 meters. The limit is around 34.9 m, in practice this figure reaches 30 m.
The maximum indicator is 3 m 3 / hour . The real operating point is in the area of ​​2 m 3 / hour. 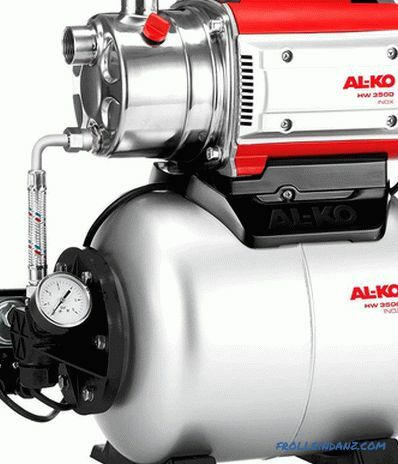 This pump station creates increased comfort of operation, because it provides constant high pressure. This is possible thanks to the special design of the pump and the availability of high-quality automation. This station model can also be used for irrigation in a country house. In case of emergency shutdown of the pump after a specified time, the station is restarted. It is also possible to set the station to temporarily turn on, which significantly saves resources. This model of the station is an expensive pleasure, the price starts from 75 thousand rubles and above. compactness due to a small accumulator . The limit is in the area of ​​42 m, in practice this figure reaches 38 m.
The maximum figure is 3.6 m 3 / hour . The real operating point is in the region of 2.3 m 3 / hour. The Spanish manufacturer ESPA is pleased with high quality. 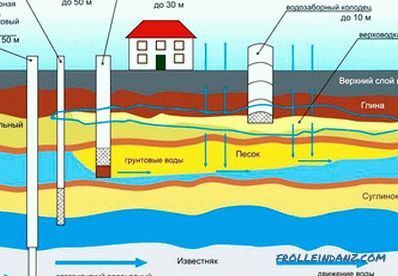 The cost of this pumping station starts from 50 thousand rubles and above. The price of the unit fully justifies the quality. The station provides the consumer with a stable pressure and water pressure. It does not matter the number of consumers. It is used for pumping clean water from wells, boreholes, as well as from rivers, lakes and other sources. all hydraulic components are made of non rusting steel and non-oxidizing polymers. This figure is 20 meters. Immerses directly into the water source. The limit is around 40 m, in practice this figure reaches 35 m.
The maximum indicator is 3 m 3 / hour. The real operating point is in the area of ​​2 m 3 / hour. So, we have provided you with comprehensive information on the choice of pumping station. We hope that this will help you make the right choice. We offer you in this article introductory videos that allow to delve into other details of the choice. As for the brands of pumping stations, there are many.The main guideline of the choice we outlined in this article, namely, the depth of water intake, the volume of the storage tank (hydroaccumulator), power and performance. Starting from this, select the model that best suits your conditions and financial capabilities. Happy shopping!